I ❤️ my instant pot and I also ❤️ mashed potatoes. 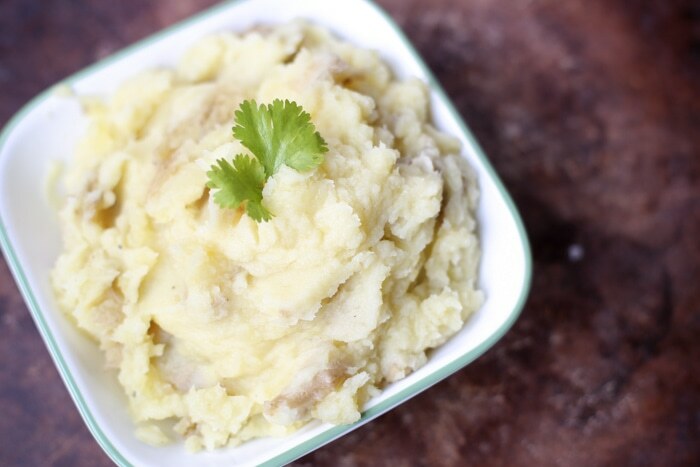 The combination in making Instant Pot Mashed Potatoes is 👏 🙌 – aka high five worthy. So here’s the real question. To peel or not to peel? 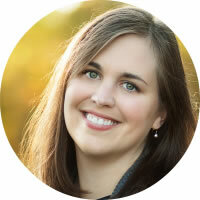 I’ve always been a mashed potatoes with peel kind of girl. 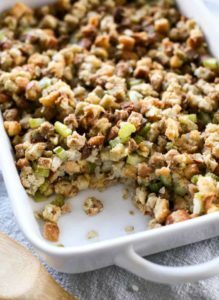 It’s a combination of the fact that I love the texture it adds – without the peel it makes it feel slightly not homemade. Got peel? – you know it’s homemade. I also, more importantly, don’t like to peel potatoes. 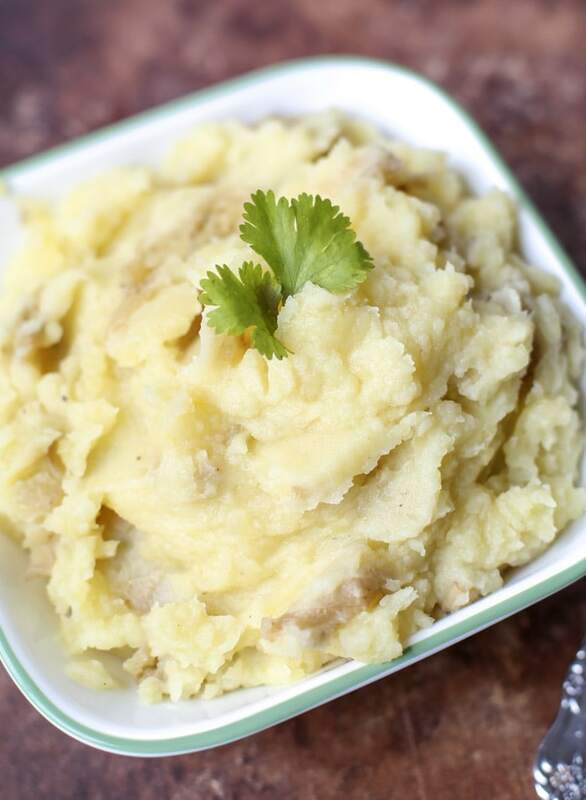 I’ve shared my crockpot mashed potatoes recipe with you, and it’s amazing. 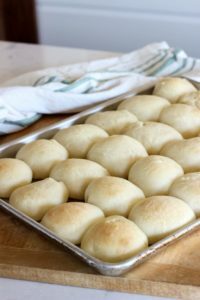 So I thought to myself – why not make them in the instant pot to see if you can get the same great buttery flavor in less time. Well, I’m happy to share that yes. you. can. Yukon Gold potatoes. Hands down. They are the best. What I like about them is their deep flavor. But even better is the fact that their skin is so thin that you don’t have to peel them to make great mashed potatoes. In fact, they’re better if you don’t peel them. 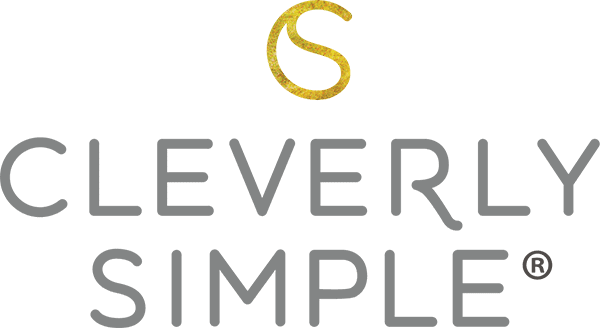 It’s all about the skin and making homemade more awesome with less work. 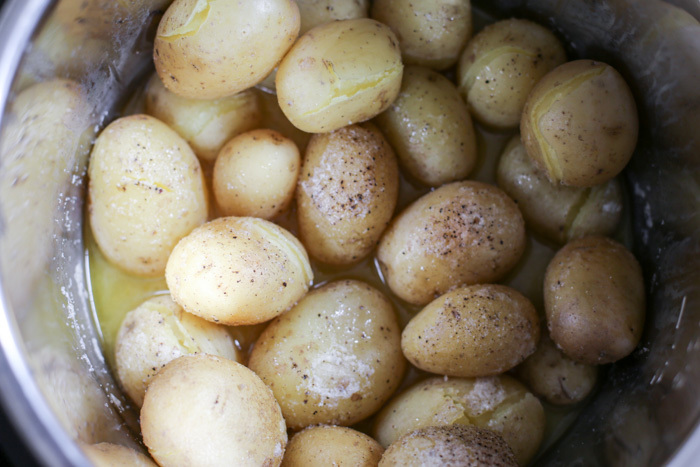 Also known as a pressure cooker, the three pound of gold potatoes I used in this recipe took only 10 minutes on the high pressure setting with quick release. 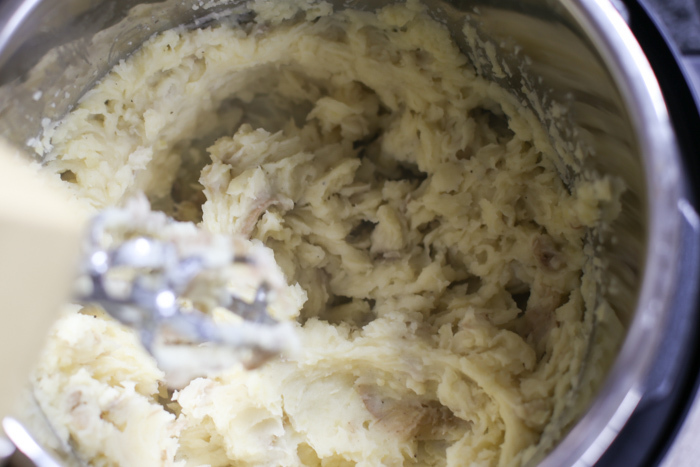 What I love about making a big pot of mashed potatoes is that it’s always too much for my family of four. Into the freezer the leftovers go. 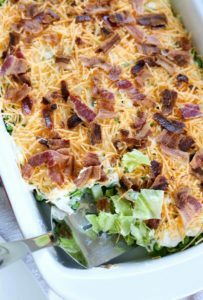 I pull them out on a busy night and have one awesome homemade side dish that I didn’t have to do anything to make. Well, I had to push the buttons on the microwave to reheat, but you get the idea. After cooking, I mash them with my hand chopper. I then take my hand mixer and whip them up. There was enough liquid that I didn’t have to add any milk. Mix and done. 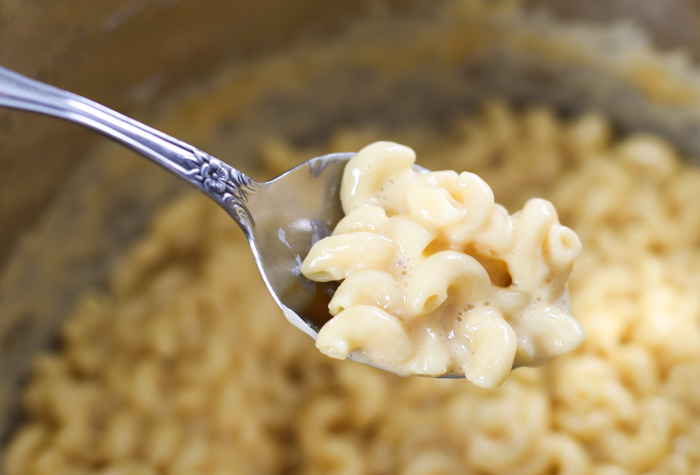 If you have an instant pot or pressure cooker, this is a quick way to put an awesome homemade side on the table for dinner. 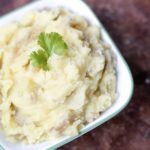 Instant Pot mashed potatoes for the win! 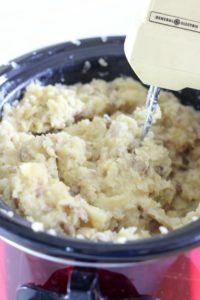 How to make easy Yukon Gold Instant Pot Mashed Potatoes with skin. So yummy! 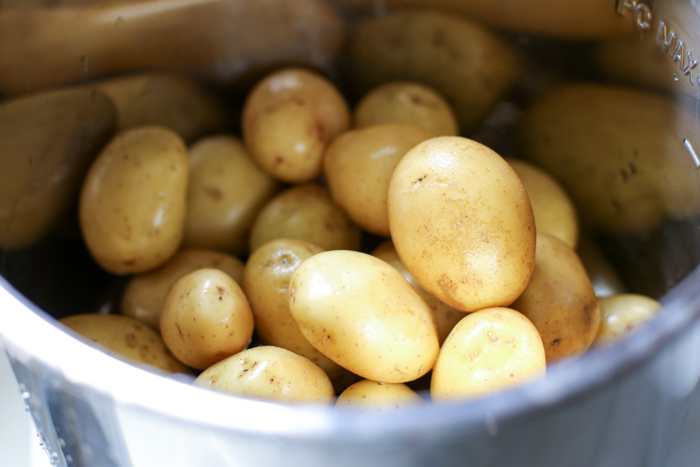 Wash and add whole potatoes to the instant pot. On your instant pot enable “high pressure” making sure the valve is sealed. Set for 10 minutes. Once complete, release the pressure with the “quick release” of the valve. Mash and then whip together with a hand mixer. Add milk if needed. You can season your potatoes how you like. I like less pepper, but you may want to add more. 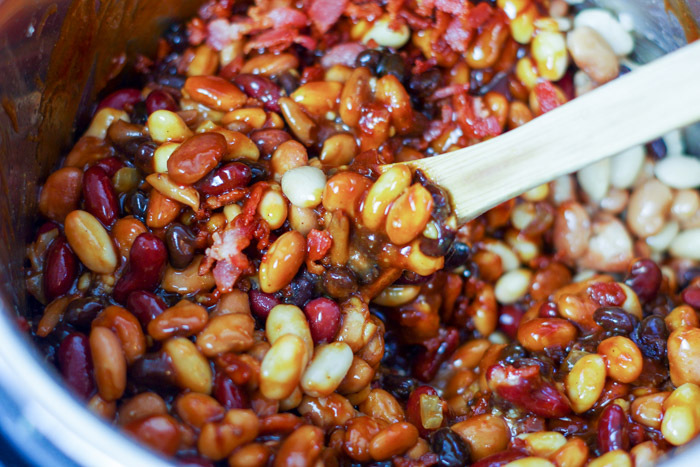 This recipe is completely adaptable!